When I got the package from Marx Foods filled with truffle salt, fennel pollen, pasta and dried mushrooms—I was so excited to use the gourmet ingredients to make a fancy-schmancy meal. Especially the truffle salt. It wasn’t until today that I realized that the smell of truffles does not sit well with me. And, the taste is not my favorite either. I know, I know—-how can I not like truffle salt? I have a similar problem with cheesecake, creme brulee, and most white sauces. I’m weird. 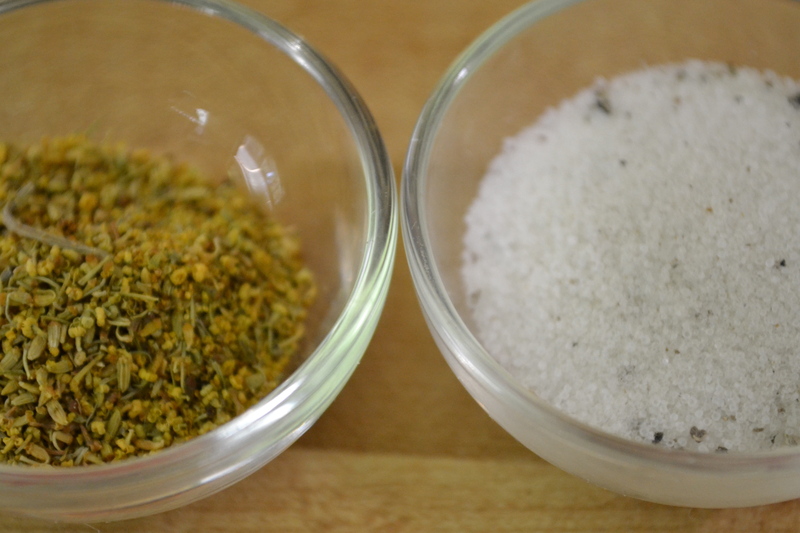 So, for my original recipe–I decided not to use the truffle salt and to focus on the fennel pollen (which smelled amazing!) and the pasta. My goal was to make a meal that the kids would eat without too much fuss and chicken and pasta is always a good combination in our house. Nice and simple. Simple and tasty. 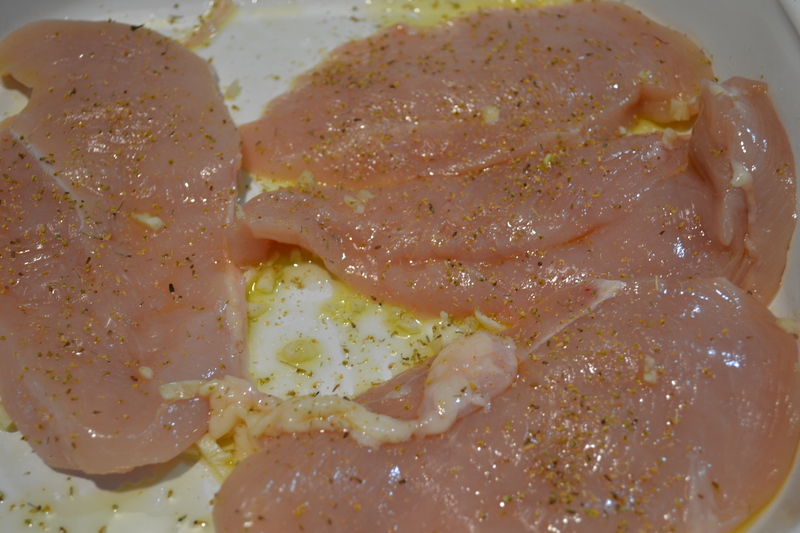 I let the breasts sit in the fridge for about 2 hours while I made some cookies and prepared the rest of the meal. The chicken breasts were later grilled outside—-one of the perks of living in Florida, year round outdoor grilling. You can see the little flecks of the fennel pollen—yum! Second, I prepared a little bit of a white sauce. This was kind of an experiment and I wasn’t quite sure how much to make. I melted about 3 Tablespoons of butter in a saucepan, added 3 cloves of minced garlic. I added about 1/4 cup of chicken stock and turned up the heat–for about 4 minutes. Once a lot of the liquid cooked away–I turned down the heat and added about 1/4 cup of heavy cream–stirring all the while. This created just a little bit of sauce but was really all that was necessary. While I was making the sauce, I also prepared the pasta. 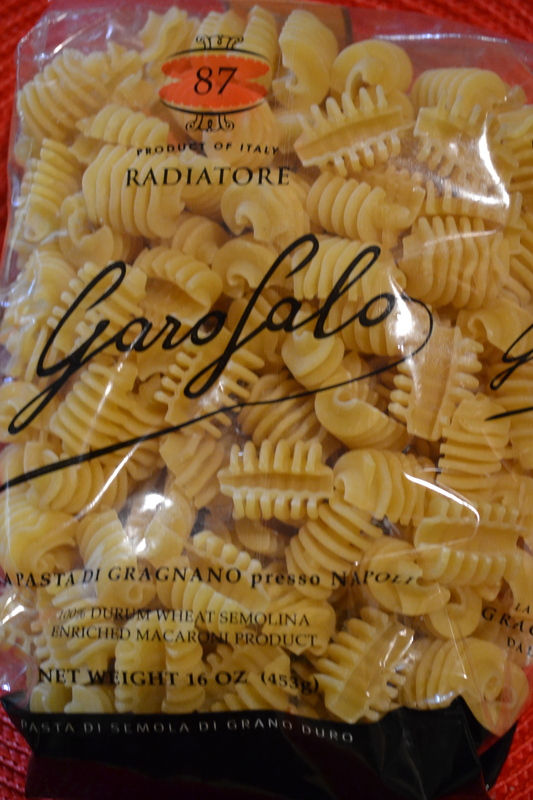 Marx Foods had sent me a kind of pasta I had never tried—Radiatore–which has an interesting shape and would be good for a super thick red sauce. Unfortunately, that wasn’t what I had planned to make. Maybe next time. 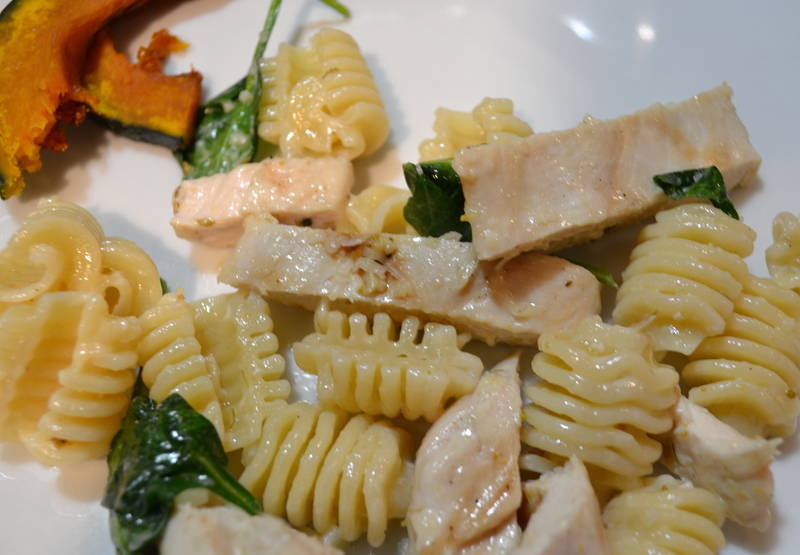 Once all the pieces were prepared, the pasta was very simple to throw together. In a large bowl, I layered about one-third of the cooked pasta, a large handful of spinach, one-third of the white sauce–and then continued the process until all the ingredients had been used. 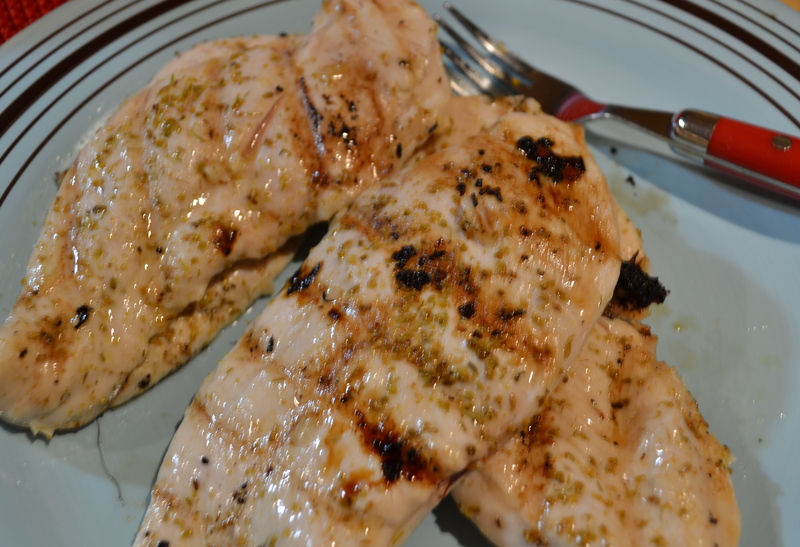 I topped the entire thing with grilled chicken cut into strips and a healthy amount of freshly grated Parmesan cheese. I tossed it around and served it with roasted Kabocha (Japanese pumpkin) sprinkled with truffle salt. 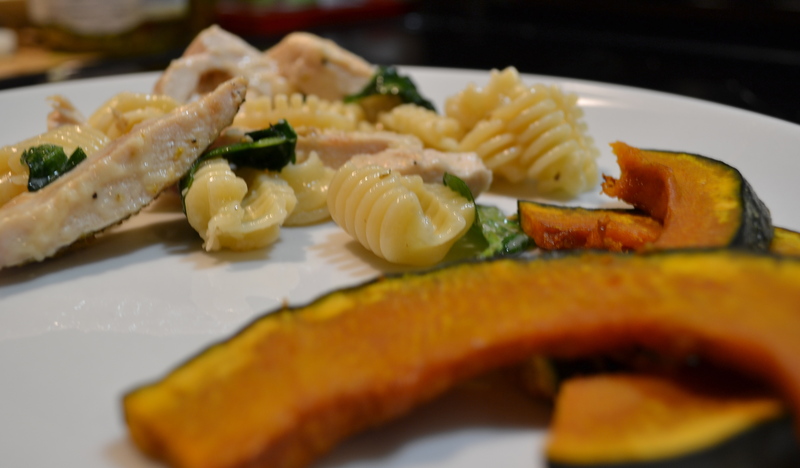 P.S.–Stay tuned for the Kabocha recipe–something everyone will want to make. So good and super healthy too! Foodbuzz 24×24: Party Food on A Stick! This sounds delicious. 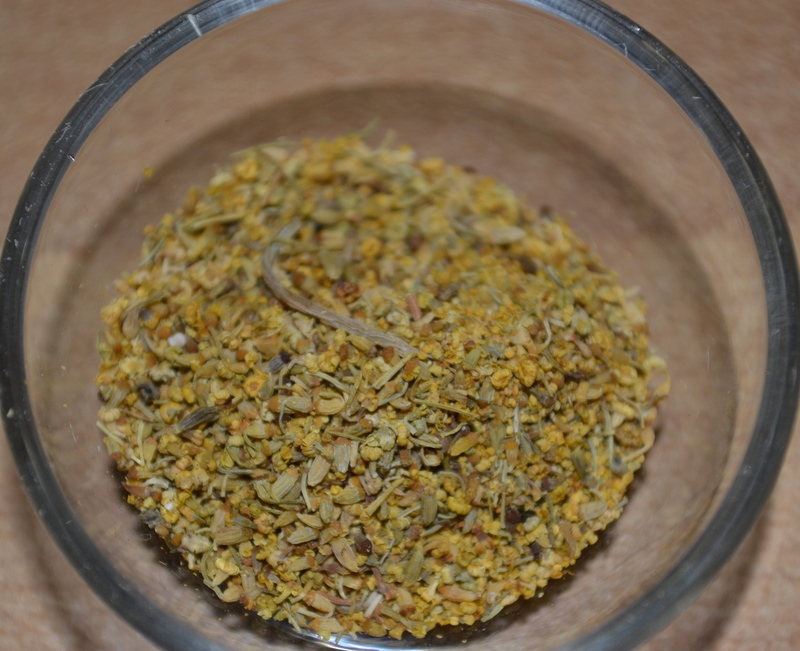 I’ve been hanging on to my fennel pollen with no clue what to use it for yet! Hey! I would like to wish you and your family calm and Merry Christmas. I dream that new year will be very happy for everybody. It is ideal time to make friends and it is time to be smiled. I have read that post and if I might I want propse you few important things or advice. Maybe you can create next posts reffering to this post. I want to read more things about it!